Office technology and design are constantly evolving, and this year’s hot new thing could be next year’s fax machine. With that in mind, Robin brings you The State of the Office 2018—a series of in-depth articles detailing how innovations in technology and design are changing various aspects of the workplace, and what everyone from CIOs to office managers needs to know to stay current. Each week, we’ll issue a new report focusing on a different section of the office. This week: the lobby. LinkedIn SF’s impressive public lobby that seems to say, “This is a place where creativity and innovation are unleashed.” Photo via Business Insider. If first impressions are everything, then the office lobby is the business equivalent of a first-date outfit. It’s what visitors—and employees—see the moment they enter a company’s office, setting the tone for everything that comes after. It’s a company’s first chance to send its desired message. At leading brands, that message is increasingly being strengthened and amplified by technology. Below, we explore three IT trends influencing the current state of lobby spaces, and dive into how implementing them at the first point of contact can put you ahead of the competition. Skyscanner installed the smart doorbell Ring, recently acquired by Amazon, for a seamless visiting experience. Photo via Ring. Ever visit an office and immediately feel like an annoyance or, worse, a ghost? Maybe the receptionist couldn’t find your name on the visitor list, or they couldn’t get in touch with who you’d come to see. Maybe there was no employee staffing the lobby, but also no obvious way to get someone’s attention. Whether a visitor is a potential intern or a potential million-dollar client, forcing them to wait awkwardly and impatiently is not how you want to introduce them to your company. Spotify, L’Oréal, Slack, and POPSUGAR, among other leading companies, use the visitor management systems to seamlessly sign in visitors and communicate their values—professionalism, efficiency, attention to detail—from the get-go. Visitor check-in is fast at Airbnb, Audi, and Acer, too, thanks to the app Proxyclick. (Maybe being at the top of the alphabet is useful for more than roll call.) WeWork-owned Welkio, meanwhile, automatically notifies employees of a visit using Slack, HipChat, email, or text message. Sine is arguably the best option if your company has on-site contract employees—the app lets you geofence your office to track time, attendance, work orders, and permits. Other sign-in platforms have machine-learning integrations that pull up returning visitors’ info automatically. Still others have tech with face-recognition capabilities. China-based Face++, for instance, can identify visitors before they even enter the office, rendering the whole check-in process obsolete. For companies without a concierge or receptionist on site, a technology-enabled sign-in experience is not only budget-friendly and secure—the software can track who’s in the building at all times—but also efficient for employees. At Skyscanner’s Miami office, the smart doorbell Ring unobtrusively notifies employees via an app when a visitor arrives, guarding employees’ focus and time. Skyscanner now wants to take things one step further: It’s looking for a secure login system to automate the entire process, from visitor sign-in to host notification. Visitors at Daimler Trucks North America in Portland, Ore., can get immersed in the company’s history through interactive touch screens. Photo via Four Winds Interactive. What’s the personality of your brand’s messaging? Visitors to Skyscanner immediately know the company is “all about travel,” Conrado said, because both Skyscanner’s prominent brand logo and its front desk in the lobby are shaped like an airplane wing, and a wall behind cushioned benches displays the company’s timeline since its 2004 launch. In other companies’ lobbies, thoughtful design details—like a 3D logo (Square), a fun replica of a famous room (GitHub), or a sleek coffee bar staffed by a friendly barista (Evernote)—align with the ethos of the company. Other forward-thinking companies’ lobbies have advanced video, lighting, and interactive screen technology to promote their brand narrative while flaunting their technical bonafides—the brand equivalent of a shiny Rolex. GoPro’s lobby at its San Mateo, Calif., headquarters, for instance, is adorned with large displays that show action-packed clips taken with the company’s video camera. There’s a visceral sense of how high-energy both GoPro’s products and work environment are. PepsiCo’s headquarters in upstate New York uses interactive displays to showcase the company’s rich, storied history. Visitors who enter the New York City headquarters of iHeartMedia walk through a Star Wars-esque hallway with custom dual-color LED fixtures that shift and move. And in the lobby of Sony’s headquarters, a spartan, all-white design directs visitors’ focus to multi-panel LED billboards that play music videos while an integrated sound system booms bass. – Todd DeGarmo, CEO of Studios Architecture, the firm that designed the office. 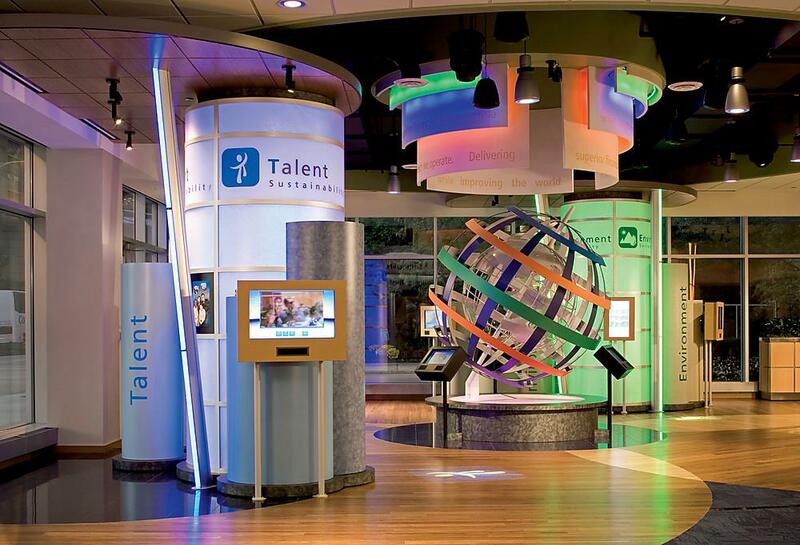 Other companies have scaled up their screens to transform their lobbies into awe-inspiring visual displays. In Salesforce’s lobby in San Francisco, a 107-foot-long LED wall displays images and video footage in crisp 12K resolution. (Mashable said it “might be the coolest office lobby ever,” and we’d have to agree.) At Daimler Trucks’ new headquarters in Portland, Ore., the company aimed to “make a statement as soon as people entered the building.” That statement comes in the form of a 59-screen, 110-foot-wide video wall that wraps around a corner of the lobby, displays a timeline of the company’s history and product innovations, and can easily be customized depending on the office’s visitors that day. Robin’s real-time interactive map and calendar, Status Board, is available to everyone as soon as they arrive in the office. Photo via Robin. While interactive maps and a real-time office schedule might not come to mind when you picture an office lobby, having these platforms displayed on smart TVs can streamline visitors’ and employees’. Robin’s newly launched Status Board, for instance, displays space availability in an office in real time: Available spaces appear at the top, and icons next to each space show the amenities of that particular room. If the most appropriate space is already booked, Status Board can help determine whom to contact. BIG IDEA: Placing displays like this near your front entrance communicates to both guests and employees that you’re a company that values time, efficiency, and the magic of momentum. When it comes to great first impressions, a lobby is much like the clothes you wear—you want the non-verbal messages you communicate to be in line with your values and mission. If your company aspires to be forward-thinking and technologically savvy, integrating software and hardware that smooth out the initial experience for visitors will go a long way. What’s more, doing so will remind your employees every time they walk through the door that they’re working for a company that represents the future—a future they’re a part of. Now that’s a reason to hustle! We’ve covered conference rooms and lobbies, so what’s next? The future of the desk.